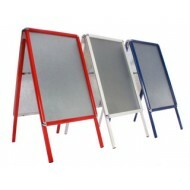 Our Snap Frame A-Boards are ideal for promoting your business. perfect for your pavement or forecourt, our A-boards are strong and durable. They are hinged, with a stay to lock them open, which allows them to close flat when being stored. They are manufactured in aluminium and your posters are displayed behind sheets of anti-glare UV grade PVC. Ideal for indoors or outdoor use, the edges of our Snap Frame A Boards clip open and closed allowing you to change your posters quickly and easily. Bespoke colours and sizes are available to order. We also stock Water Based Signs.